You can dual boot Ubuntu with Windows, but there is a way to create a virtual machine. So you still have your main operating system installed o your computer and with special software, you install a virtual op.system. I have posted How to install Ubuntu in VMware. So after we have installed it in VMware, we need to install VMware tools in Ubuntu ( Important! to have a drag/drop, copy/paste from host to the virtual machine, and fix the screen size etc.). But before make sure you have already installed latest updates on your Ubuntu system. After that, we can begin the tools installation process. 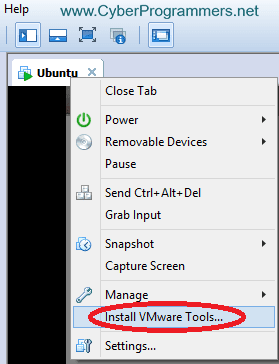 Start Ubuntu system, Right click on its tab in VMware and select Install VMware Tools line. After that in opened file manager window select and copy tar.gz format archive file into the Desktop. First of all, we need to execute "sudo passwd root" command and after then type your user password 3 times. After executing ls command, you can see the archive name in red, you must do change the command to tar -xvzf "archive name"
Now keep pressing the enter button on the keyboard until installation finishes. And when it's finished you need to reboot your machine. After reboot, you can use full-screen Ubuntu op.system with installed VMware tools.